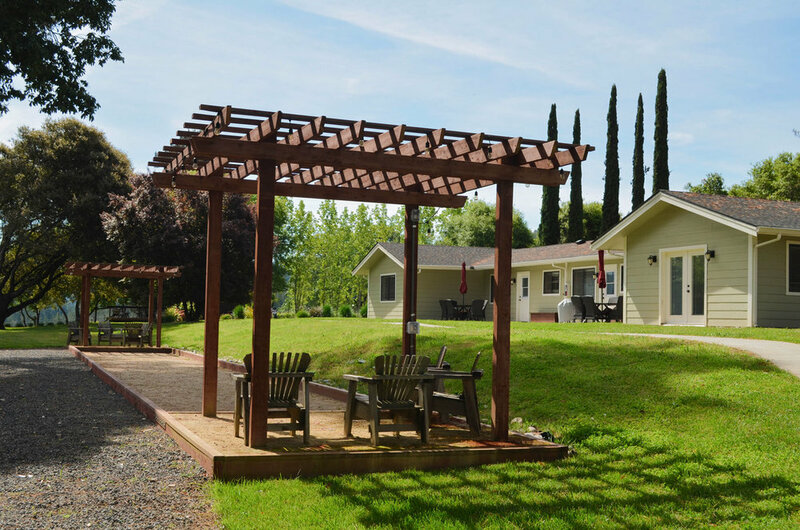 Situated a short drive off Highway 128 just outside of Philo, Indian Creek Inn’s three buildings provide a total of 15 clean and comfortable rooms for guests. Relaxation is guaranteed thanks to our unique Home-Style Lodging, evident in the rooms’ modern decor and custom art, as well as the dining and sitting areas and full kitchens that are included in each room grouping. Each Deluxe Room contains a queen bed with premium linens, desk area with focused lighting, and wall closet. The Suites have a second room that can be used as a bedroom for additional guests or a sitting room. Standard Rooms come with a queen bed and wardrobe, and all rooms have their own private bathrooms. There’s a bocce ball court on Hilltop where you can relax with a game on an easy afternoon, drinking in the valley views between your turns. There are Weber 22” charcoal barbeques and shaded outdoor seating for each building so you can grill up your dinner as the cool summer evenings set it, possibly with a bottle of local wine from one of our neighbors. Take a break and enjoy the views from the sitting decks you’ll find at some particularly lovely lookout spots. Also take a look at the Walkable Destinations and Area Attractions as you plan your trip.